To keep counter space free, some cabinet designers include a microwave oven that function as drawer or that are placed over the range allowing for a more incorporated look. Some kitchen designers also suggest using some open shelving and/or glass cabinets instead of using all solid door wall cabinets. This gives the illusion of more space. If you opt for an island, integrate cabinets into the island and/or provide seating that can be stored under the island when not in use. Chairs and stools without arms also allow for more appearance of space. 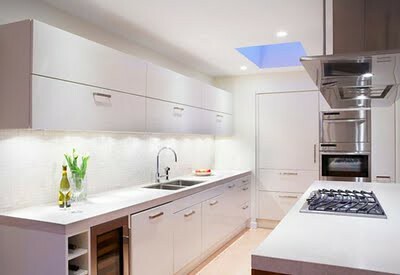 Corners are one of the most difficult spaces for a designer to utilize in a kitchen. Some place their appliances such as the oven or refrigerator in the corner to cut the corners. Many even place the kitchen sink there to refrain from using those sharp corners. When there isn’t a sharp corner, the countertop seems to flow more. Corners can also be built in an angled way that gives an appearance of space though the cabinet space may be triangular in shape. Lazy Susan base cabinet corners are another way to utilize corner space. 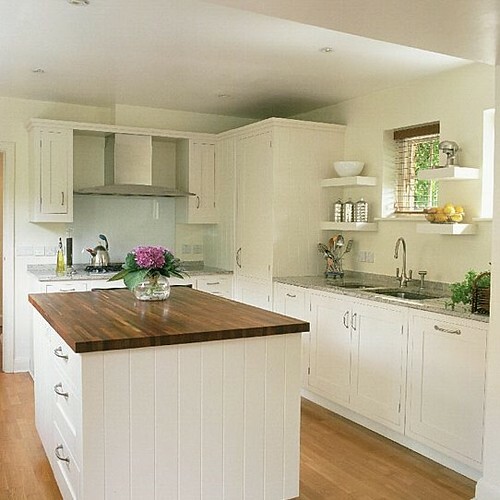 Lastly, special angled corner wall cabinets can be a more efficient use of corner cabinet space. 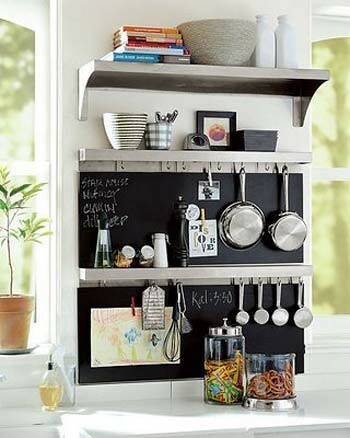 Pantry and spice rack pull outs are other great ways to utilize all the cabinet space. These spice racks and pantry pull outs can use the deep and thin space that often goes wasted in kitchens. Toe-kick drawers also allow for the usual wasted spaces to be taken advantage of. These drawers open with a quick push, and can placed under the lower cabinets. Another simple way to use all space and give the appearance of extra space is re-thinking designs. Trays and baskets can both organize and carry kitchen clutter. Pot and pan racks hung from the ceiling or walls decorate the walls and keep the cabinets open for other items. Opting for smaller appliances can also keep small kitchens open for space. Rolling carts can be a cook’s best friend, acting as an organizer that can been moved and stored wherever necessary. David Cormier is a blogger for Wood Cabinet Factory, who gaurantees the lowest prices on cabinets and counter tops.